Furniture Clinic are industry leaders and experts in the cleaning and restoration of leather. For over ten years we have manufactured the best available cleaning, conditioning, protection, repair and restoration products for all items of leather. The franchise opportunity being offered is to open your own leather repair franchise, under the Furniture Clinic brand. You would be given a specified territory, agreed by Furniture Clinic Headquarters, where you would be able to develop your business with the support of our franchise management and development team who will assist with anything from technical queries on leather repair to providing marketing advice on positioning and artwork for any local advertising you decide to do to help grow your business. You will be provided with extensive initial training from our qualified training experts who will show you our innovative techniques to clean, remove stains, repair holes and tears and restore or change color to any leather item. While you would primarily be dealing in leather furniture repairs, opportunities are available in industries as varied automotive, marine, aviation, equestrian, fashion, hospitality and building maintenance. This means that the volume of leads generated are huge giving you the opportunity to grow your business quickly and effectively, all while learning a valuable skill that is in demand across the United Kingdom. What is also beneficial to the franchisee is that the business model is scalable, meaning that you have the choice and flexibility to grow the business to as large as you wish. You can stay as a one-person, mobile repair service or grow by taking on additional employees, workshop space and extra vehicles to make the most of the market within the territory you have obtained, and we will support you every step of the way. You also have the opportunity to purchase surrounding territories and grow your business in this way, giving you additional market size and opportunity for work. 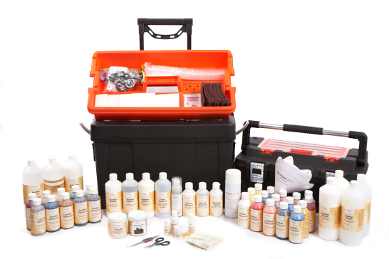 The initial fee is to cover the three weeks of intensive training by our leather experts, the wide range of equipment needed to perform the repairs and manage your operation and a huge selection of cleaning, repair and restoration products that we supply to allow you to get started. Simply put, you receive everything you need to get your business going and continue to run it in an effective, efficient and successful way.